Do I give my baskets the right amount of water? It is a big guess for many growers and inspired Michigan growers Jared and Jordan Dekker of Dekker Brothers Greenhouse in Hudsonville. Together with Len Logsdon, they designed a watering solution for hanging baskets by using the weight as starting point. The solution is named the Control Dekk OASIS and can be installed on new or existing greenhouse cable conveyors. Jared and Jordan are growers themselves and, as water is a vital component of a grower’s business, watering was on their mind throughout the entire day. “There was actually no perfect solution that would give us peace of mind. 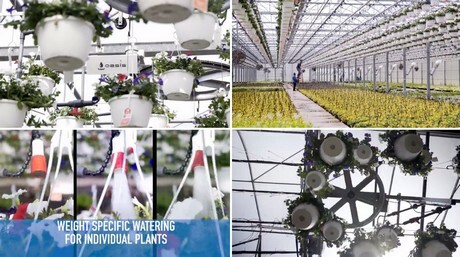 If we use an automated system that waters on time, we always had the risk of over or under watering some baskets and watering them manually is a very labor intensive and time consuming job”, says Jared. A smart controller and a local user interface allows the grower to control and monitor the basket line at the conveyor while a single, remote graphical interface is used to provide enhanced functionality for multiple lines from an office PC or wirelessly, using a smart phone or tablet. In this way, each basket is receiving exactly what it needs. According to Jared, this solution is a real game changer as it will not only give the grower peace of mind, it will also improve the crop and reduce the use of water.